Herbicides » Freehand » HE29100 - Surf the Turf! Combines two active ingredients for a broader range of control. Delivers excellent residual control in container medium, stopping weeds as they germinate. Offers a wide range of plant species tolerance and use sites. Provides exceptional rate flexibility. Weeds listed above can be controlled when FreeHand 1.75G is applied at rate ranges of 100-200 lbs./A as listed on the product label. Higher rates will control a greater number of species and provide longer residual per application. 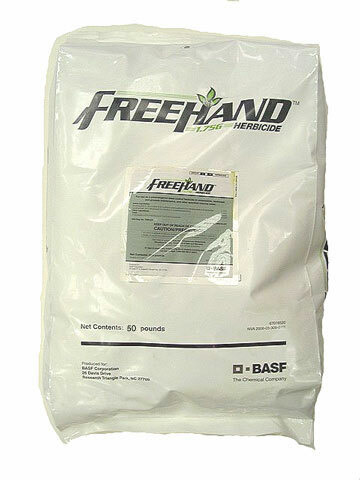 Where To Use FreeHand 1.75G FreeHand 1.75G is labeled for use in landscape ornamentals in maintained areas (residential and commercial) and general grounds maintenance in specified noncrop areas, container, liner and field commercial nurseries, and Christmas trees and other forest tree nurseries. Refer to product label for additional information. Keys to Success Uniform coverage prior to weed germination and emergence insures optimal weed control. Application to dry foliage is recommended. Efficacy will be improved if application is followed by one-half inch of irrigation or equivalent in rainfall. Use lowest label rate and avoid overlap on grower-identified sensitive plant species or as stated on label. To assure good product stewardship and resistance management for weed species shifts, use this product in rotation with other ornamental registered products within the landscape program. If desired, however, a sequential application of FreeHand 1.75G can be reapplied following 8 weeks, with no greater than 400 lbs./A of product at any application. Application rate: 2.3 lbs. to 4.6 lbs. per 1,000 sq. ft or 100 to 200 lbs per acre.